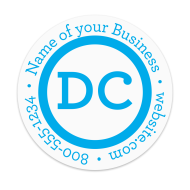 These business stickers and labels are available in a variety of sizes and styles. Custom label all your envelopes, packages, products and more with personalized business stickers or thank you for your business stickers. Choose the template that represents your brand best and send us your logo and/or imprint information. The Mines Press collection of designer stickers has options that will satisfy all of your sticker and label printing needs. 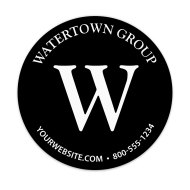 Print your custom logo in full color to complement one of our pre-designed messages, or print your business information as a signature around one of our designs. 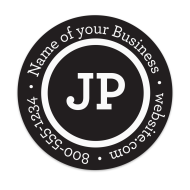 We also carry a line of modern business sticker designs with trendy monograms and initials. These stickers are ideal to freshen up your brand and to give a sophisticated look to all of your packages, mailings, products, handouts, and more! 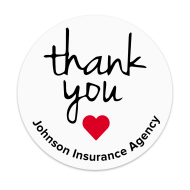 Say "thank you" to your customers, either for doing business with you or for providing referrals and generating new opportunities for your company. So you should consider stocking up on custom "Thank You” stickers that you can use for labeling purposes every time you need to show extra appreciation. 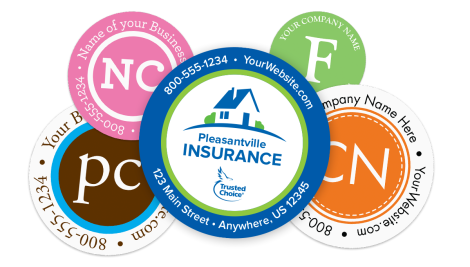 Our personalized sticker designs will help your business create and maintain a strong brand presence. They can also be an effective tool to help bring new life to an existing promotional campaign that is losing steam.